"Webster" is a bear made by Russ Berrie, and looks so cute in his ducks costume. He has a plush teddy bear brown head with black eyes and an embroidered brown nose. 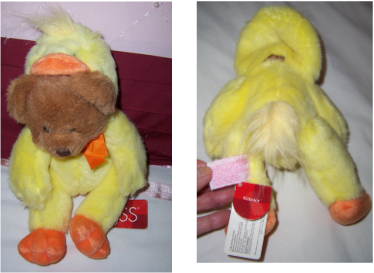 He is wearing a non removable yellow and orange duck costume, and has a bean bag type of body fill. His hat can be pulled off his head. He is in excellent condition and still retains his material tag to his leg and his original paper hangtag which states his original cost of $26.95. A lovely little retired Russ Berrie teddy bear. 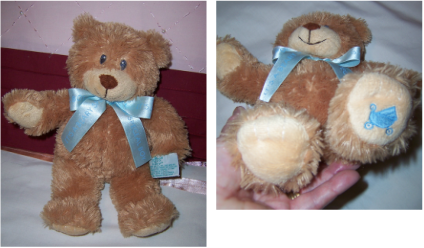 This Russ Berrie Teddy bear is very light, soft and cuddly and would be the ideal gift for a newborn baby boy. He has embroidered eyes, brown furry nose, embroided mouth, non jointed, soft lighter brown velour pads on feet, and embroidered blue baby pram on one of his foot pads - see picture. He is in wonderful condition, and has his original pale blue satin ribbon around his neck, and cloth tag to his body.